63-years after the military plane crash in Alaska that killed them, funerals have been set for two Missouri men. Air Force Airman 3rd Class Wayne Dean Jackson of Downing and Army Technical Sergeant Leonard George Unger of Gerald were two of 52 other men killed November 22, 1952, when the C-124 Globemaster they were aboard crashed into Mount Gannett in Alaska. The military earlier this year announced that remains recovered from the wreckage were identified as belonging to Jackson and Unger. Remains of Unger will arrive Thursday at the Russell Colonial Funeral Home in St. Claire. A visitation will be Friday from 5 until 8 and Saturday after 9, with a funeral Saturday at 10 at the funeral home. He will then be buried in Crestview Memorial Park, next to his wife, Geneva. Remains of Jackson will be taken August 4 to the Downing Christian Church. A visitation will be held there Friday, August 5 with a funeral the next day. Jackson will be buried in the Downing City Cemetery in a plot between his parents, where his mother had a marker placed for him years ago. 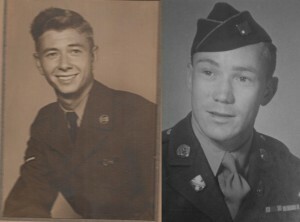 Both men will be laid to rest with full military honors and escorts by the Patriot Guard. Unger’s son, Raymond Unger of St. Claire, was 5 when the crash happened. He told Missourinet he didn’t think he’d ever get to have a funeral for his father. “After 63 years it’s kind of nice to do it,” Unger told Missourinet. Vicki Kelso Dodson claims Jackson as a brother. She was 7 when he died. “I am just at times overwhelmed,” Dodson said of being able to have a funeral. “One of the last things his mother … said to me before she died, that she thought they would go back to that mountain and bring those boys home, and I would always say, ‘I hope so.’ But she was right,” Dodson told Missourinet. “I know people say, ‘You were only 7,’ but it was such a traumatic thing and because we talked about every day I think that’s why it’s stayed with me all this time,” said Dodson. A third man who died in that crash and has ties to Missouri is Private Robert Dale Card. Originally of Kansas, he has a brother and family living near Springfield. There has been no report of remains being identified as belonging to him. The wreckage of that plane was covered with snow and lost soon after the crash, but was rediscovered in 2012. 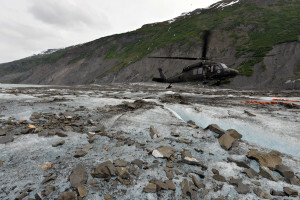 It had been carried some 16 kilometers from the crash site by the Colony Glacier. Since then military teams have gone to the site to recover any remains and wreckage they could before they are carried into nearby Lake George. 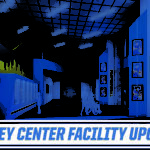 Because of the weather and terrain in the region, the site is only accessible about two weeks out of the year, in June. A team will fly back to the wreckage site next month to continue that operation.